Mercer University Press: Christmas Gift! Includes audio CD read by the author. Christmas Gift!, a master storyteller’s moving personal reminiscence, discovers the very essence of the holiday season. The wonder and excitement of childhood combine with the wisdom and reverence of maturity to produce a tale rich in tradition and continuity. 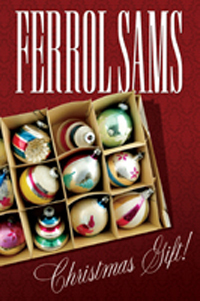 Interweaving his memories of boyhood Christmases in the dark days of the Depression and the details of present-day holidays with his grandchildren, Ferrol Sams demonstrates the deep, inescapable role of rituals in our lives and the importance of passing them on to each succeeding generation. Rich with details as true today as they were more than a half-century ago when Sams was growing up, Christmas Gift! is a grandfather’s loving preservation of an important ritual of his childhood. Strapped for material resources adequate to their generous spirits, members of the Sams household would greet each other with the joyous cry of “Christmas gift!” in order to share the tidings of the season and celebrate their connection. Fifty years later, in a moving and powerful rite of passage, Sams initiates his grandchildren in the ways of family and tradition by sharing his story and by taking them to their great-grandfather’s grave early on a clear Christmas morning to shout forth the ancient cry: “Christmas gift! Christmas gift!” Sams is in rare form in this tale that will warm hearts, create laughter and tears, and earn a place in the center of Christmas celebrations for years to come.